Welcome to Grandview East at Long Beach vacation rentals! Emerald Coast by Owner is proud to offer you a number of these amazing properties full of elegance, luxury and comfort set to satisfy your every need while you stay! This large condominium complex sits right on the beach, giving you a breathtaking view and incredibly convenient location! Condos here range from 2, 3 and 4 bedrooms, all equipped with large living space, big gulf front balconies, gourmet kitchens and a jacuzzi tub in every unit! Amenities of this resort consist of 2 heated gulf front pools, complimentary beach service and a fitness facility! When it comes to the fun outside the resort, you’re in luck! There’s an endless amount of things to do, so you’ve got all the variety in the world! Some popular ones are racing go karts, mini golf, paddle boarding, beautiful helicopter tours above the coast, deep sea fishing, diving charters, boat tours, Ripley’s Believe It or Not! Museum and so much more! When the activities are over and you’re ready for a meal, you’ve come to the right place! There’s an abundance of excellent seafood and traditional food spots around here, so you won’t be disappointed! If you’re looking for a good time with great eats, service and drinks, we recommend a few places! Some of our favorites are Montego Bay Seafood House, Firefly for fine dining and Saltwater Grill! Come on down and treat yourself right, you won’t regret it! 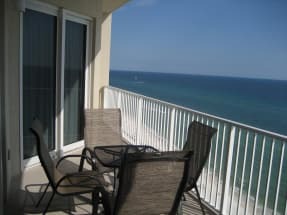 Whether you are looking to rent or buy your next vacation home, Emerald Coast by Owner can help. Click here now and view our listings including Grandview East at Long Beach. When you book with Emerald Coast by Owner, we make it easy for you to choose where, when, and what you want to do on your trip. Contact us with any questions!